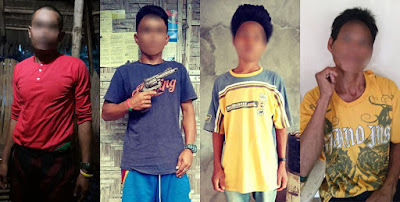 MALUNGON, Sarangani - Another four NPA terrorists voluntarily surrendered along with their firearms to the troops of 73rd Infantry Battalion (IB) in Brgy Upper Suyan, Malapatan here and Brgy. Little Baguio in Malita, Davao Occidental on January 19 & 20, 2019. Alias Klawag and Alias Rebreb, both residents of Brgy. Upper Suyan surrendered to the Scout Platoon of 73rd IB during its field operation in Sitio Kakob, the same barangay. They also handed over their M16 rifle and .38 pistol. The following day, alias Jason and alias Rusi, both residents of Brgy Kihan, Malapatan of the same province surrendered to the troops of Delta Company, 73rd IB in Brgy Little Baguio, Malita, Davao Occidental. They also surrendered a carbine rifle and calibre 357 pistol. "Wala natuman ang ilang gisaad nga suporta alang sa among pamilya. Puro kalisod, gutom ug kahadlok among gibati. (The Suporta Para sa Pamilya that they promised was not materialized. All we experienced were hardships, hunger, and fear)," alias Jason said. "With our intensive security operations and continuous collaborations with our Barangay Officials, we can gear our efforts towards the attainment of peace in our communities," Col Marion Ancao, Commander, 73IB said. “We are once again calling the NPAs to go back to the folds of law, various benefits are enhanced to support you and your families especially when you surrender and lay down your firearms,” he added. Meanwhile, Major General Jose Faustino Jr, Commander, 10ID applauded the determination of the 1002nd Brigade and its troops for sustaining the gains through the continuous surrender of Communist terror group (CTG) in its area of responsibility.